You can save 50 pesos if you register with Smart Surfmax 200 promo than a P50.00 Surfmax daily surfing package. This is very good offer to Smart Bro prepaid subscribers who love to get connected and go online the whole weekdays. For only 200 pesos, you will enjoy unlimited surfing for up to 5 days with a daily limit 800MB. You can do web browsing, access your social media accounts like Facebook, Twitter, Instagram, music streaming and more with this promo. Unlike All Out Surf, GigaSurf and Big Bytes promo, with Smart Bro Surfmax 200 you can still continue using the internet and do minimal browsing activities even if you already consumed the 800MB data daily limit. The slow internet surfing speed will restore back to normal after 12 midnight. You can subscribe to this promo with your nearest load retailer, via SMS keyword and through Smart online dashboard. If you prefer to register via SMS, all you need to do is reload your Smart Bro prepaid account with 200 pesos. Just use the correct format below and read our tips before you start using this promo. Just dial *121#, select Surfmax then navigate to available offers. Check other denominations of Surfmax LTE Internet Surfing promos. Please note that SurfMax 200 promo is only available for Smart Bro Prepaid SIM (LTE and non-LTE) and postpaid. 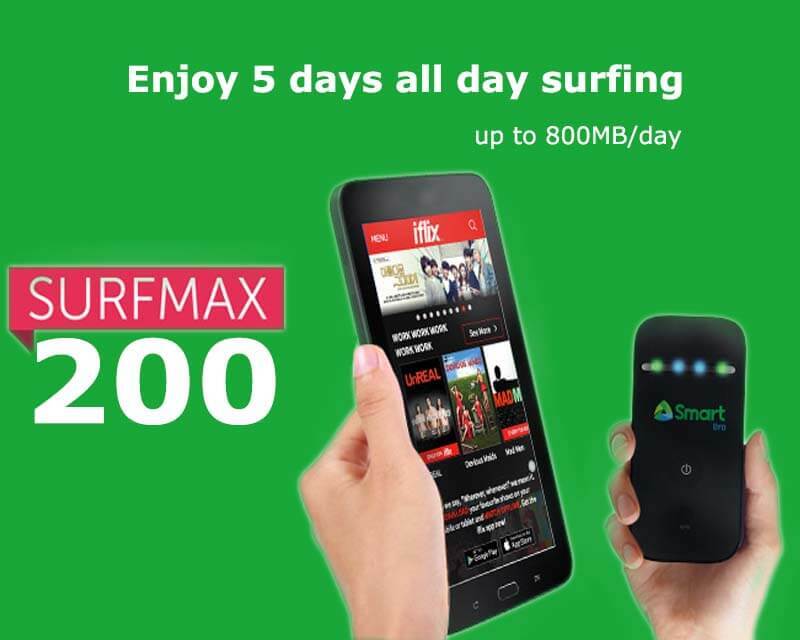 For non-Smart broadband subscribers, you can try out Surfmax Plus and other Surf max denominations. Before you start using this promo, make sure you received the SMS notification from Smart that says Surfmax200 is now active and ready to use. Check your location if LTE network is available, use it on LTE SIM and LTE capable device or Pocket Wi-Fi to enjoy faster browsing speed. You will also receive an SMS text alert once you reach 80% to monitor your daily remaining balance or data usage.